Run to the death - Should we ban the Grand National? Run to the death – Should we ban the Grand National? The recent death of yet another young horse at the 2019 Grand National has revived the debate whether England's most famous steeple race should be banned from the race calendars. Just horses at the end of the day? So Should the Grand National be banned? The 2019 Grand National held at Aintree Race Courses near Liverpool has yet set another record: Viewing figures for the 3 day event peaked at 8.8million, a 60.3 per cent share of the television audience, beating last years's peak of 8.5m and 56.3 per cent share. Run over 4½ miles and featuring 30 jumps, the Aintree Grand National Race Course is one of the most demanding in the world. Famous for it's unpredictability, broken necks, backs and legs are not uncommon. The latest casualty, a 6 year old stud named Seedling that died after falling at one of the hurdles, has horse friends, animal rights activists and politicians once again demanding the race to be banned from the annual british race calendar. And Seedling is neither the first nor the last to have lost its' life on the track. Since 2000 a whooping number of 40 casualties have been documented, not counting those horses that had to be put down in the aftermath. One of the pre-race favourites Balthazar King luckily survived his fall with several broken ribs and is now – accoring to the latest news – on his way to recuperation. But it is not only the deaths that need to be considered. Its the too long track and the too demanding obstacles that leave the horses so exhausted that they are neither willing nor able to finish the race, some of them collapsing just shortly before the finish line. There is no denying, that horse racing is a multi billion dollar industry in the UK. It is estimated that approximately a quarter of the UK's adult population is betting on the Grand National every year. But it seems that nowadays race horses are nothing more than tools for those involved in the industry. The 2013 pre-race statement of one of the country's top female jockey Katie Walsch seems to sum it up quite nicely: “I hope to God there are no accidents this year but these things happen, and they're horses at the end of the day”. Over 40 horses have died in the Aintree Gand National race since 2000 – According to the British Horse Racing Authority steeplechase races have an average of just over 4 equine fatalities for every 1.000 horses taking part. 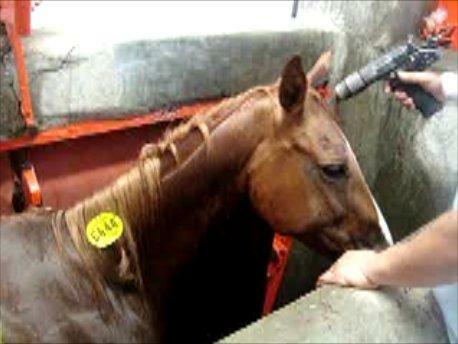 Every year, about 200 horses die in races across the country. 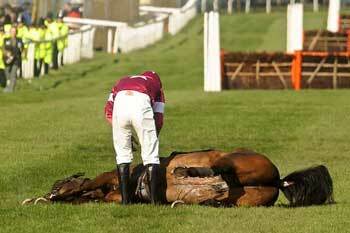 In the past 15 years, 40 horses have found their death at the Aintree race tracks. Even more horses have taken a fall, sometimes leading to their death later on…. e Fences around the Grand National Race track fence number 6 (and 22) also known as Becher's Brook is the deadliest, holding the sad record of most fatalities throughout the years with a whooping number of 14 in total. Having been compared to “jumping of the edge of the worl” the notorious obstacle has led to many controversies due to its size, angle and 6ft 9 drop. Extreme distance – over the years the distance of the race has steadily increased from four miles to four-and-a-half-miles. One-and-a-half miles more than the average steeple race. The course is considered too long, with too many demanding fences to jump. Due to the distance many horses are too exhausted making them prone for accidents casued by lack of concentration. Horses are too exhausted to finish race – Over the years, the event has seen numerous horses collapse during, at the end and after the race. In 2009 Hear the Echo collapsed and died shortly before the finishing line. In 2011 Grand National Winner Ballabriggs overexhausted himself – due to being thrashed by his Jockey Jason Maguire at the end of the race – to a point where he needed to be given oxygen. Jockey Jason Maguire was banned from racing for five days but was allowed to keep the prize money and his winner's position. Too many runners – Crowding and speed are a fatal and oftentimes deadly factor in the race. Over the years the number of runners has steadily increased from 29 to 40. 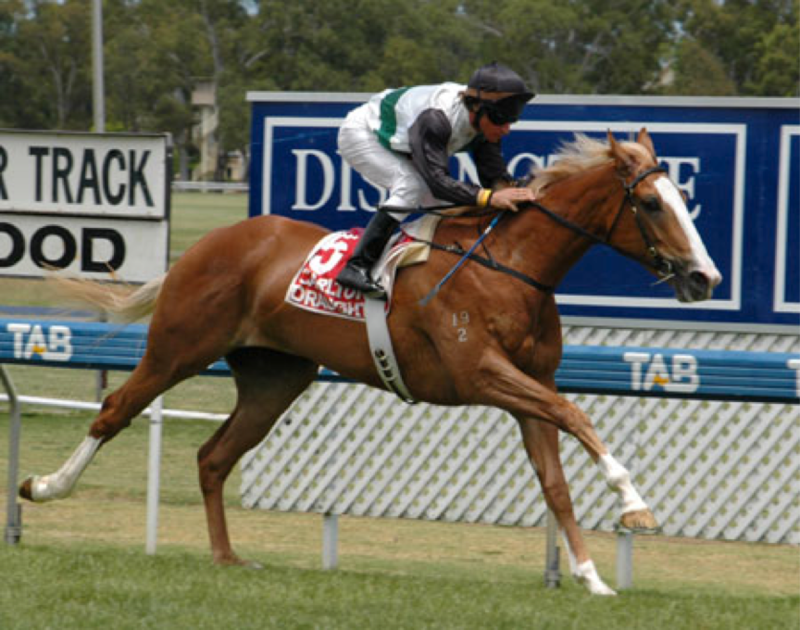 Raced when too young – Unlike in dressage or show jumping, horses bred to be raced are usually broken in when they are just babies, making their bones and still underdeveloped muscles unable to cope with the stress of the track. As a result, many yearlings sustain grave injuries early on – a great number of them will never even start in a professional race. Just some 40 years ago, the average age of a horse to be raced was 3 years. As the sport became more and more professional and money became a huge factor, the racing of two year olds was introduced in order to see a quicker return on investement. If you take into account, that horses do not reach skelettal majurity till the age of 5, it is even more outrageous that races for two-year-olds are among the highest paid races. Many of the horses are slaughtered after their career is over – as much as they are worth during their glorious days as champion race horses, once their career is over most of those once successful racers end up at the slaughterhouse. Injured horses or those that are merely too old to return a profit have very little value to their owners and in most cases are discarded of quickly oftentimes ending up as dog food. Few of them will be lucky enough to end up at pony clubs or riding schools where they can lead a quiet life. Before taking the extreme and drastic measure of banning one of the most famous racing events in the british horse racing calendar, there are some measures that could be taken to make the race less demanding on the horses and thus reducing the risk for horse and jockey. Some might argue now, that those features are what makes the race one of the most anticipated in the year. But honestly, the £1m in prize money will still ensure the quality of the participants and thus ensure a fantastic spectacle for the audience with people betting on the event just as eagerly as they did before. At the same time, the more reasonable conditions will result in the race being less stressfull for the participating runners making the race safer for both horse and jockey and also lowering the risk of the race being banned completely due to contestants perishing on the track. Should the Grand National be banned? Leave a comment and let us know what you think! Betminded » Online Betting guide » Run to the death – Should we ban the Grand National?